Oo na, ako na! Ako na mag-isa! 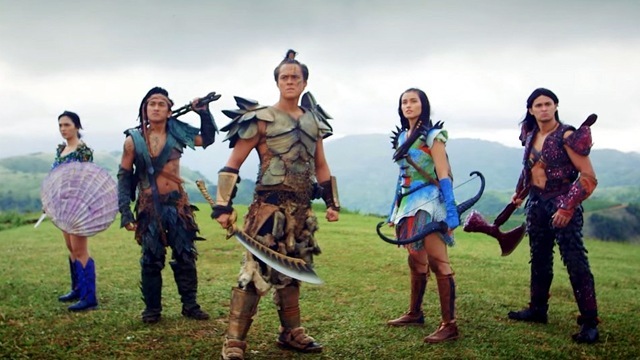 (SPOT.ph) There's no doubt that Pinoys love their romantic movies. Whether it's a rom-com about two people conquering the odds or a drama about getting over a breakup, it's bound to be a hit for folks who love everything about love. But not everyone immediately gets their happy ending with someone else. Sometimes, your happily ever after can be just with yourself. The same goes for characters in the movies, too! 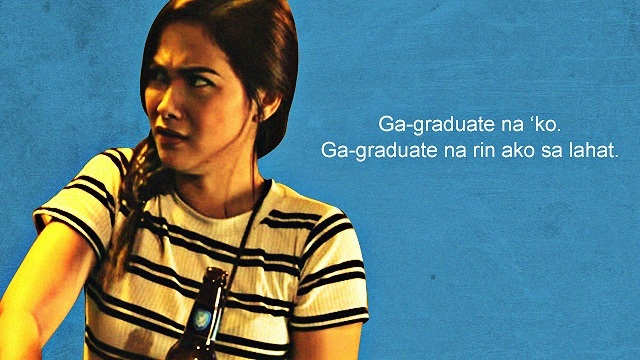 It's really not that bad being single (even if a lot of movies tell you otherwise)—and these quotes from local flicks prove it. One of the more famous lines of One More Chance is undoubtedly Trisha’s (Maja Salvador) lyrics for Popoy (John Lloyd Cruz). Admit it: You just can’t read “Happy monthsary” without thinking of her. But one of the underrated characters from the movie is Mark, Basha’s (Bea Alonzo) friend who Popoy thought is her rebound boyfriend. 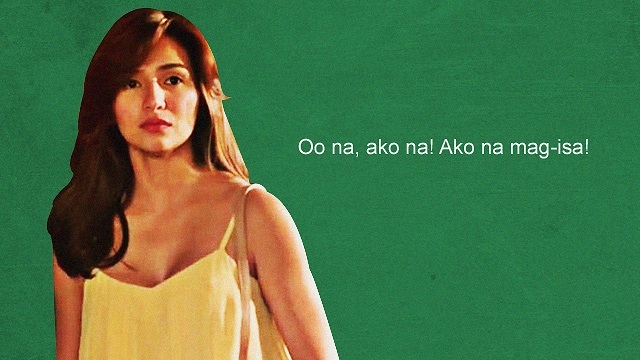 When Mark and Basha meet to celebrate Mark's new home with his actual girlfriend, he tells her this line to comfort her since she seems to be regretting her decision to break up with Popoy. It’s just what you need to hear when you start to doubt the right decisions you made for yourself, because #LoveYourself should always be the priority. This rom-com is based on a self-help book by Ramon Bautista, who makes cameos in the film both as an extra and as a narrator of the development of Sandy (Kim Chiu) and Alex’s (Xian Lim) relationship. Alex helps Sandy become more likeable after she gets dumped by her boyfriend, but eventually the two start to form an unexpected relationship. At one point in the movie, Alex offers to accompany Sandy during a cab ride and they go back and forth while people are waiting in line. Forced to witness the flirtatious banter, a frustrated Ramon makes an appearance and says the hilarious line. It really is okay being single, it just gets annoying when you get dragged into a couple’s pabebe-ness. 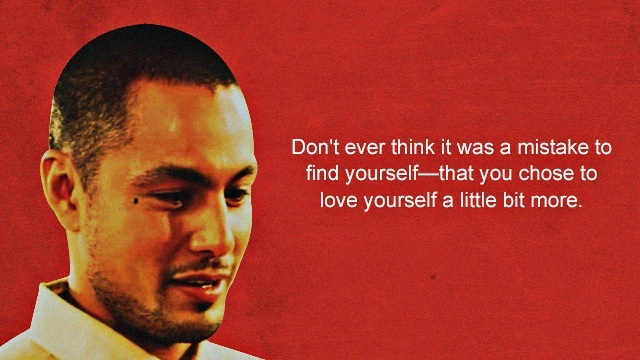 Tere (Jennylyn Mercado), heartbroken over her last relationship, is hired as an English tutor by Filipino-American Julian (Derek Ramsey) and slowly starts falling for him. This line from from the movie is when Tere is standing in line for the jeep. The conductor, who’s looking for just one more person for the ride, shamelessly shouts, “Baka meron diyang isa lang! Walang boyfriend, walang asawa, walang kamag-anak!” prompting Tere’s impulsive response. It might have been said out of anger and/or frustration, but hey, it’s not bad to own up to being single! At least it’s easier to get on the jeep! This rom-com follows the story of how Anthony tries to help Mace (Angelica Panganiban) get over being dumped by her boyfriend of eight years. They travel to Northern Luzon, all the while talking about the best way to get over someone—it’s basically a movie about learning how to be single. This line is one of the many words of wisdom spoken throughout the movie. You might be single, but it’s up to you how to spend your time. You can sulk, enjoy your own company, enjoy others’ company, or even have the chance to fall in love with someone new. Either way, it’s your decision! It might sound a bit harsh, but it’s true—and it might just be your mantra for those days you find yourself falling head over heels for someone you know isn’t for you. In this rom-com (that actually feels like a drama), Ginny abruptly leaves her boyfriend Marco (Piolo Pascual) to study abroad. Years later, she returns to find him already in love with someone else. She’s tempted to try and win him back so she talks herself out of the situation, telling herself that she’s supposed to be smarter than that. A movie about five girls (Yassi Pressman, Bela Padilla, Arci Muñoz, Andi Eigenmann, Kim Molina) retreating to a camp specifically for the heartbroken is bound to have more than a few hugot lines. They all had their hearts broken in different ways—one gets left behind by her boyfriend, one can’t even get a boyfriend, and still, another gets heartbroken since her boyfriend is actually married and has a family. This line from the movie shows just how negatively people usually look at being single. You’re not bitter—sometimes, the pain is really just part of the healing. Set after the events of A Very Special Love and You Changed My Life, It Takes a Man and a Woman follows what happens when Laida Magtalas sees her boyfriend Miggy (John Lloyd Cruz) kissing his friend Belle (Isabelle Daza). They break up and Laida starts working in New York. After a few years, she returns to help out with Miggy’s struggling company. Wanting to impress Miggy and Belle (who have started dating), she puts forward the new and improved version of herself. Her mantra also becomes, “People change. Nothing stays the same forever. 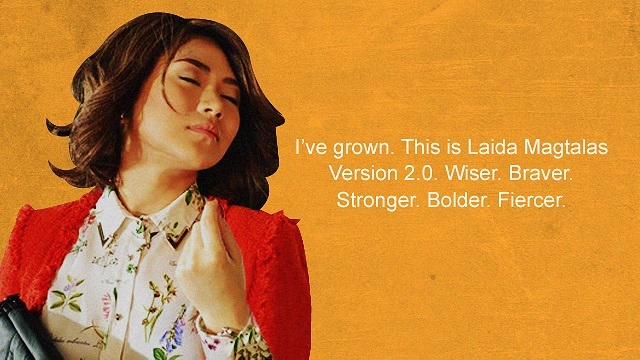 Change is bound to happen.” You can just replace Laida’s name in the quote with yours, and you’ll be ready to work through whatever it is life throws at you. Chinggay has been happily single for seven years ever since her last relationship ended. But then she finds herself in a tight spot when two men suddenly start to woo her: A customer-turned-good-friend Ryan (Ian Veneracion) and her ex-boyfriend Frank (Richard Yap). At one point, she tries balancing her affections for the two, but she also comes to her own realizations about the benefits of living the single life. Carson has been in love with her best friend Dio (Paulo Avelino) for seven years. Right before their graduation, Dio invites Carson to go with him to a music festival in La Union. Thinking it would be the perfect time to finally confess her feelings, Carson enlists the help of her gay friend Jason (Dominic Roco), who also encourages her. But in La Union, Carson sees Dio cozying up to Pathy (Jasmine Curtis-Smith) and starts to doubt whether or not she should continue with her plan. Even if you’re not graduating, this line is the perfect boost you need when you find yourself in doubt over your (non-existent) relationship status. The romantic drama stars Sarah Geronimo as Trixie, an aspiring musician studying to become a lawyer because of her mother’s wishes. She gets noticed by Gino (Piolo Pascual), a musician, and they collaborate on a song together. They start to fall for each other but eventually, their personal problems catch up with them and they break up, only to meet again years later. 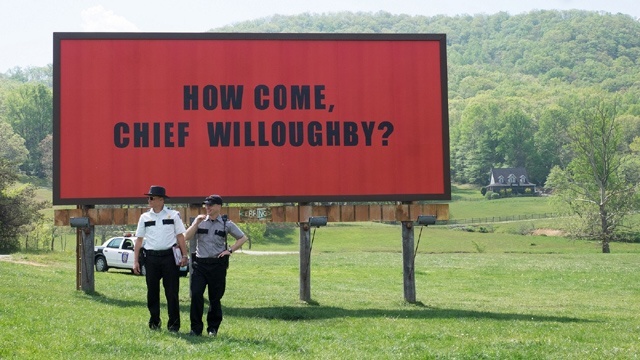 A movie about angsty music delivers with this just-as-fierce line. It’s perfect for when your ex tries to get into touch with you even when you’ve been staying single and strong for a couple of years.